The music ministry and familiar presence of Rebecca “Becky” Ogle as organist for forty-two years at The Neighborhood Church are extraordinary. How and why? After moving to California, Becky embraced the myriad challenges of offering private piano lessons, directing a church choir, teaching public school music classes and playing organ at weddings, including The Neighborhood Church. When Becky accepted the position as church organist in January, 1977, her music ministry began to flourish. Within two months she performed The Passion According to St. John by Johann Sebastian Bach with the Covenant Choir and orchestra. With the support of Gene, her husband, and Daniel, her son, each week she brought to the Thursday evening and extra Saturday morning choir rehearsals, Sunday worship services, Vesper services, Christmas Eve services, weddings and memorial services her kit of musical tools to promote an environment of joy, meditation, friendship, gratitude and creativity. She expressed her love of musical expression to cultivate an appreciation of music in others through a weekly exposure to the most meaningful examples of original organ music written by the great composers or hymn transcriptions by prominent contemporaries. Becky, as mother, cultivated loyal friendships with choir members and parents, and later, as a grandparent, swapped stories. With her contagious smile, humble manner and fierce pursuit of excellence, she worked cooperatively with six music directors: Don Whitsitt, Randy McChesney, Vince Cole, Buddy James, Craig Fentor and David Sateren. Highlights of her tenure at The Neighborhood Church illuminate her versatility and talent. She sang the alto part in a popular quartet during the 1980s along with Ruth and Chuck Hattersley and Bob Tomlinson. In major works she sang the alto part with the Covenant Choir when there was no organ part in the accompaniment. She traveled to Germany in 1998 to provide input for the construction of the new Glatter-Götz organ. As Chair of the Organ Committee, she led the effort to enhance the community’s exposure to our unique tracker organ and to world-class organists and organ repertoire by hosting an annual winter organ concert. In 2000 the committee selected her to play in one of four inaugural-year concerts. Her stellar, hour-long program showcased her exceptional talent and playful use of various new organ sounds. In 2011 the Women’s Fellowship and in 2017 the congregation gave Becky special recognition for her dedication to providing a personal, meaningful worship experience. What’s so special about the organ? It’s just a church organ, isn’t it? Well, that started it. The Trustees formed a committee who in time hired a consultant knowledgeable about organs: Ladd Thomas of Pasadena. Thomas had just completed the purchase of an organ for the UCC Church in Claremont, California, and in fact the organ builder was in town seeing to the installation. Caspar von Glatter-Götz, from a long recognized firm of organ builders, came to Neighborhood Church and the result was a contract pleasing to all, and especially to the lovely lady and her husband, Sandy and Barney Barnett. Workers begin construction on the organ at the Glatter-Götz workshop in Owingen, Germany. Our Organ took four men over two months to install, features 1900 pipes and weighs over 5 tons. It is called a “little gem” among the famed Glatter-Götz organs of the world. Once installed, the pipes needed to be voiced. Voicing is a meticulous process where each pipe is individually adjusted to produce the best tone quality, or timbre, possible. Luckily for us, Manuel Rosales, master voicer, was right here in Los Angeles to do this over a nine-month period. Manuel was also part of the design team from the beginning, and created the tonal design of the instrument, The instrument took a year to design and build in Germany and another four months to construct the chancel to house the 1900 pipes of the “tracker” organ which mechanically links the keys to the air valves for responsiveness and compact design. It took four men over two months to install the five-ton organ, and nine months to voice; about 2 and a half years all together…but what a treasured result. We call it a “little gem.” It is the best organ money could buy and it is the baby sister of the massive Disney Hall organ which was built and voiced by the same firms. So yes. It’s JUST a church organ but since Easter Sunday, 1999, there’s never been another like it. Becky Ogle, seated, surveys the new organ in its “birthplace” in Owingen, Germany, shortly before it was disassembled and shipped to the U.S. Behind her are owner, Caspar von Glatter-Götz (left) and his partner, Heinz Kremnitzer, who headed up the installation of the organ once it arrived in Palos Verdes. Now that you know the story, want to hear our organ in action? Join us February 17, 2019, for our annual Organ Concert featuring renowned organist Adam J. Brakel! You could ask just about anyone in our congregation about Ruberta Weaver and their response would probably be a mix of admiration, amazement and gratitude. After all, it’s not every day that you meet a 102 year old woman who Ubers to choir practice every Thursday and Church every Sunday. But that’s Ruberta— over one hundred and still singing in the choir, active in the Church and community, and reading scripture passages once a month on Sundays. She has a famously warm and engaging speaking voice, and earlier this year agreed to record a Bible passage of the Christmas Story to be shared with our Church family and friends. We hope you enjoy Ruberta’s reading of The Christmas Story and share it with someone this Christmas season. You can listen below or check us out on iTunes (link below)! Ruberta, thank you for sharing your many gifts with us every Sunday! We are grateful for your love and service and blessed to have you as a part of our Church family. The Shepherd Scene from the Christmas Pageant, where our actors get a little help from some furry friends! Plans for the 65th Annual Neighborhood Christmas pageant began in January 2018 as the group of organizers convened to discuss what worked well for the 2017 pageant and how it could be improved in 2018. We were excited about how well the pageant was received by the community with wonderful crowds of young and old walking the grounds and taking in with awe the inspiring story of the birth of Jesus Christ. Yet, we knew there were areas that could be improved and discussion focused on how to make the 2018 Pageant outstanding for the 65th time! The plans that are laid out for this year’s pageant are focused on looking at the pageant as one of our church’s ministries of telling our Christian Story in a heartfelt way that gives all who attend the hope that God is with us on our journey today just as God was with Jesus and his parents on their journey. We hope that each scene that is depicted will be relevant to today and will share that hope and love. The Annunciation scene recognizes the fear of the unwed mother and her trust in God that she is in God’s care. The Departure scene portrays the obedience to the laws of the land as Mary and Joseph prepare to depart. The Shepherd scene (which always seems to be the children’s favorite) will once again have the 4-H club tending their animals as the shepherds gather around the fire in awe of night. The Inn is a wonderful visual of how we need to welcome strangers and provide comfort and safety for those in need. The Magi scene on the bridge over the pond shows us how educated people study and learn and had hopes for a just and loving leader. King Herod’s Court depicts a party focused on Herod. It looks like great fun if you are Herod but what about the people he is ruling and the decrees he makes when having all male babies killed. And finally we are taken to the Manger scene as we approach in awe and hope in EVERY child’s birth and life. Whether you join us as a cast member, an usher, a singer, a director, a stage hand, costumer, makeup artist, a photographer, a publicity guru, or kitchen crew your presence and support will make this year’s pageant a success for the 65th time! Thank you to the over 125 people who were part of making last year’s pageant so meaningful and thank you in advance to all who answer the call and say YES to joining this year for another opportunity to share our Christian Story with the community. The season of Advent in the Church is once again upon us. The word Advent comes from the Latin word adventus which means “coming towards.” It is a season of the church that is celebrated on the 4 Sundays before Christmas. Advent is viewed by many as a time of anticipation and expectation of the coming of Jesus. But it’s meaning is so much more than that. One needs only to look at symbolism of the four Advent Candles to see a broader meaning for the season. One of the candles is lit during each worship service on the four Sundays. There is also a fifth candle lit in the Christmas worship service. These candles may have different meanings to different congregations. The most common Advent candle tradition is that the first candle is the candle of hope. It represents the prophets of the old Testament waiting in hope for the coming of the Messiah. The second candle represents faith, especially the prophet Micah who foretold that the Messiah would be born in Bethlehem, the city in which King David was born. The third candle symbolizes joy which comes from the great joy of the shepherds when the angels announced that Jesus came for all people including humble and societal outcasts like them. The fourth candle represents peace that calls us to remember that Jesus came to bring peace by bringing all people close to God and to each other. The fifth candle represents light and purity and is called Christ’s candle to symbolize the light and the purity Jesus brought to the world. I think that during this Advent season our world needs much more hope, faith, joy, peace and the light of Jesus Christ. Let us all do what we can to make that happen. A collage of some of the leaves of gratitude that were presented by our congregation on November 18, 2018. Here at the Neighborhood Church, two seasons go together at this time of year – Stewardship and Thanksgiving. Harvest Sunday was held November 18th when we had the ingathering of our pledged intentions for the financial support of our ministries during the coming year of 2019. The symbolism is strong as we bring together the fruits of our labors monetarily for the sake of our community of faith. On November 25th we will celebrate Thanksgiving Sunday, giving thanks for all the blessings in our lives. Not only are these two Sundays tied together with Thanksgiving in between – but on the 18th our congregation presented leaves on which were written personal expressions of gratitude when they also brought forward their pledge cards during a time of offering and dedication. Those leaves will be hung on trees in the sanctuary for worship on Thanksgiving Sunday as our Trees of Gratitude compliment all the Thanksgiving decorations and theme. Here you will find pictures of some of those leaves. Please note the variety of expressions from some of our youngest members and youth to our more mature in years. These special Sundays provide everyone a way to offer gratitude and gifts – as part of the receiving and giving - that make up the rhythms of a faith-filled life. Thankful for all the blessings of our life together as the family of faith at the Neighborhood Church! Since 2015, the Neighborhood Church has partnered with Family Promise of the South Bay to help transform the lives of homeless families and children in our community. This partnership has taken many forms as it has grown throughout the years-- we’ve supported them through seasonal offerings, hands on volunteer projects, special events, and collection drives. Last year, Women’s Fellowship donated significant funds that allowed Family Promise to purchase a new van for transporting their guests. In 2017, we began serving as a support congregation, providing hot meals and care to families who are guests in the program. The hardworking members of our Christian Action Ministry are always working to find new ways to support Family Promise, and this summer, our congregation had an opportunity unlike any other. Earlier this year, Family Promise of the South Bay signed a lease on a three bedroom house to be used as interim housing for families in their program. Together, our Neighborhood Church Family came together with Family Promise volunteers to refurbish the home and turn it into a warm, welcoming and safe place for Family Promise guests. The project took place in many phases over the summer months, beginning in August with a painting and cleaning day. Almost a dozen church members showed up in their painter’s best and helped paint the bedrooms and living room and cleaned out the kitchen. New flooring was installed along with new kitchen appliances including a refrigerator and dishwasher. In September, more Neighborhood Church members helped set up the home and make it move in ready, assembling eight (!) beds and dressing them in new sheets and blankets to get them ready for families. Curtains were hung and the kitchen was stocked with utensils and cookware through generous donations that members made through a Bed Bath and Beyond registry. A special thank you to all of our church families who supported this exciting new project in any way, and to those who have supported Family Promise of the South Bay in the past. Together, our volunteers donated almost 200 hours of their time and dedication to the Family Promise Interim Housing Project! Our Women’s Fellowship and Christian Action Ministry donated a combined $5,500 to the project which was instrumental in getting the house ready for families to move in earlier this Fall. Wow what a great day today at Rat Beach! !This Coastal Cleanup Day on Saturday 15th September went way beyond expectations--it was quite simply a mind-blowing success! First of all I thank you Neighborhood Church CAM Team for making it a success and the support from Heal the Bay Co-Captains and the City of Palos Verdes Estates. None of it would have been possible without you. We had an incredible turn out and lots of trash was collected. Over 500 people took part in the Beach Cleanup, including 300 from the Buddhist Monastery in Hacienda Heights and 50 Girl Scouts! Together, we collected more than 120 pounds of all sorts of trash that doesn’t belong in our oceans and waterways, including a car tire. Thank you to everyone who came out and showed just how much they care for their creeks and their beaches and their favorite parks. About Coastal Cleanup Day: Coastal Cleanup Day is an annual Los Angeles County event sponsored by the Heal the Bay Foundation. Together, volunteers across LA County come together to clean up our beaches and remove trash and debris from our sands and shores. For several years, the Neighborhood Church Christian Action Ministry has co-sponsored the Malaga Cove/RAT Beach Cleanup, providing volunteers and administrative support to help facilitate the event. We're just over halfway through the Summer and the "dog days" of August are looming just around the corner. As he leaves for the rest of his time away, Rev. Dr. David D. Young is excited to share this summer reading list of books from his own personal collection. Got a flight or long road trip coming up this Summer? Maybe you're just looking for a good book to settle into a hammock with. Either way, we've got you covered with this mix of old favorite and newer books. Check it out and consider making a run to the library or your local bookstore! Several of these titles are also available from our Church Library! Call numbers included below. Why, God? It's a question most, if not all of us have asked at some point in our lives. When a loved one falls suddenly ill, when we see tragedies on the news, when we lose someone close to us. It's a question that Harold Kushner also asked when his three year old son was diagnosed with progeria, an extremely rare degenerative disease that meant the boy would not live beyond his teens. In this book, originally published in 1981 and since read by over 4 million readers, Kushner shares his own experiences and offers advice for finding hope and clarity in times of grief. This memoir from Victor Frankl, Holocaust Survivor and Psychiatrist, tells of the extraordinary tragedy and hardship that he endured while laboring in four different camps, including Auschwitz. Though Frankl survived, his brother, parents and pregnant wife all died during the Holocaust. Through his own experiences and in interviews with others, Frankl developed his theory of logotherapy, which teaches that meaning, not pleasure, is the single most driving force in human life. Leslie Weatherhead was the Minister at City Temple in London from 1936 until his retirement in 1960, a span of time that included the tumultuous World War II era. During WWII, London was subjected to an unending series of bombings that destroyed much of the city, including City Temple. The Will of God includes five sermons that Rev. Weatherhead shared to guide his congregation through the doubt and questioning that comes with loss and sorrow. Martin Buber was a prominent twentieth century philosopher whose works concerned everything from politics and art to Jewish mysticism, biblical studies and human encounters. I and Thou is one of Buber's best known works and examines the ways that our human relationships bring us closer to God. Buber discusses the different ways that we relate to things and each other and introduces the "I-Thou" and "I-It" dichotomy. Originally published in 1981, this book invites readers to follow a spiritual path based on the teachings of St. Anthony and ancient Egyptian Desert Fathers and Mothers. The path is comprised of three stepping stones-- Solitude, Silence and Prayer. Widely regarded as an essential Christian scholar, Nouwen crafts a way through the anger, stress and anxiety of the world and encourages readers to seek the love, peace and humility that bring us into a more authentic relationship with God and one another. In The Heart of Christianity, renowned Scholar Marcus Borg revisits the heart of Christianity and suggests that the basic tenets of a Christian life-- faith, being reborn, the kingdom of God, the gospel of love-- are relevant and important in today's world. Written during a period of turmoil and change for the Church, this book provides a glimpse into the essence of Christianity and passionately argues that living a Christian life still makes sense. This book is a collection of Lyman Beecher Lectures in Preaching delivered by Taylor at Yale Divinity School. In these collections, she examines God's silence from different perspectives-- considering how preachers speak to those who seek words from God as well as the "voice of God," and lack thereof, in scripture. Using passages from the Old Testament, Taylor poitns out how Jesus used and created silence in his teachings. Prayer is one of our most powerful practices as Christians. Sometimes we pray together, sometimes we pray privately. We may pray when seeking guidance, healing or blessing. We may pray as an act of thanks or out of joy or sorrow. Whenever we pray, argues Foster, coming to prayer is like coming home. In this book, Foster shares different forms of prayer and explains how prayer can change us, bring us closer to God, and encourage creative and passionate ministry to others. Mary Susan Gost served the UCC as Associate Conference Minister, Executive Director of the UCC Coordinating Center for Women in Church and Society, and Conference Minister for Northern California Nevada. Her extensive work in the UCC caused Gost to consider-- who is the "we" in the UCC? This book examines the founding vision of the UCC and asks how we function as a Church in the world. Gost discusses the organizational structure of the UCC and how that relates to our identity and motto-- "that they may all be one." Credo, William Sloane Coffin, Jr.
A credo is, simply, a written statement of beliefs that guide our actions. We oftentimes use them as a part of Worship Services as creeds. William Sloane Coffin, Jr. was a Presbyterian minister and longtime activist who dedicated his life to peace, sexual equality and other social justice issues. As such, Credo is a fitting title for his autobiography, a book that recounts his life and shares lessons on faith, politics and justice. In the two weeks I’ve been with you, a number of you have asked about my journey to ministry, particularly as a woman. I told the story of my initial call when I was just 13 or 14 years old and the reactions of those around me during my sermon on June 24th. There is more to the story, of course. I went to Marietta College in Ohio, chosen because it was founded by Congregationalists and because it was far enough away that my parents wouldn’t expect me home frequently. While there I started a campus ministry, a coffee house for college students in the basement of a local hotel, advised youth groups, and preached for a year at two churches in town – one right next to the Dean’s House in town, and the other six miles out of town on a dirt road. I didn’t have a car so recruited other students to drive me. One service was at 9 and the other at 11, and the churches could not have been more different. I wrote the sermon for the rural one at 9 and revised it on the ride back for the town church at 11. All of which confirmed my strong sense of call. I still had not met an ordained woman though I had heard tell of one not far from Marietta. When I arrived in the fall of 1967 at Andover Newton Theological School, I was excited about the courses I was taking and the people I was meeting. Many were supportive, some were not. As I encountered obstacles along the way, people who didn’t think women in general or this one in particular belonged in ministry, my call stayed strong. If not for their opposition, whether subtle or overt, I probably never would have become the advocate for women I became. To make a long story short, I gradually found some other women on campus who shared my concern for the church’s future if all women encountered such prejudice. We organized. We lobbied the administration. We spoke and wrote and began gradually to change the culture. I never did succeed in reaching the seemingly ancient professor who refused to call on me when I put my hand up the second week of class to ask a question. Since he never called on me, I simply kept my hand up all semester. The male students in the class began to “get it”. Nevertheless, the great majority of the faculty were over the top supportive. I’m deeply grateful. Eventually, our national President, Dr. Robert V. Moss, invited me to be a delegate to some ecumenical events nationally and internationally. Then I was elected to the national Executive Council as the youngest one ever to that date. I had the privilege of going with him and 20 or so others, including all our top national executives (the only time that’s ever happened), on a mission experiential visit to Asia in 1976. It changed my life and my perspective on the world. In my early ministry days, I had short term jobs and often had to piece together a living with as many as three or four positions at a time. I was ordained in 1972 but was unable to find a church that would consider me, never mind call me, until 1980. I served that parish for 11 years, the longest anyone had since the 1800’s. We grew from 45 in worship to 125 in the first 12-18 months, deepened faith, grew in stewardship and mission and had a great time together. While there I did my Doctor of Ministry degree and focused on the Sunday to Monday connection. From that dissertation grew my Alban Institute book, The Empowering Church. I continue to believe that we are all ministers of Jesus Christ when we choose consciously to make Christ’s way ours. And I believe that we who are ordained are set in the midst of the rest of you to preach, teach and coach you on your spiritual and vocational journeys. In 1991 I was called to be your Conference Minister here in Southern California. Conferences are creatures of the churches – your delegates and your giving to Our Church’s Wider Mission shape the life of the Conference and the national setting of the Church. So my work was to lead the staff in nurturing the churches, clergy and Pilgrim Pines to be as strong and faithful as possible. I hadn’t been here long when the riots broke out in response to the Rodney King – LAPD trial. I was here through the Sierra Madre and Northridge earthquakes and numerous wildfires, an arson, and mudslides. We reorganized the Conference, focused on building relationships, bought a bank building in Altadena and converted it to an office space to share with the Disciples of Christ, and were active in a movement for the churches to offer alternatives to gang membership through the Hope in Youth Campaign. Then I was called to Connecticut to serve the Conference that had raised me up to ministry. That is a much longer story as I was there 14 years. It was a rich and full ministry among the 245 churches of the Conference and through Silver Lake Conference Center, the camp of my youthful call to ministry. I retired in 2010 to spend time with my husband who was dying and to be his caregiver for several months at the end. Since then, I’ve flunked retirement royally, and I’m glad. I love people and love the United Church of Christ! I am pleased to be among you for this month, especially since Karl Johnson served on the search committee that called me to Southern California in 1991 and David Young was on the Conference Board of Directors in Connecticut! Pictured: Rev. Dr. Davida Foy Crabtree, who will join us for a month this Summer in Rev. Dr. David D. Young's absence. I am very pleased to introduce to you a very dear friend and colleague, The Rev. Dr. Davida Foy Crabtree who will be our guest minister for about a month this summer. She will be here from the second half of June to the middle of July and will preach four successive Sundays. She will meet with the Church Council and Trustees, be in the office a couple of hours Monday - Thursday, do a daily devotional with our children as part of Vacation Bible Camp and teach a three week Adult Education Class. Davida is a gifted and faithful minister and knows some of our members from the 1990’s when she served as the Conference Minister here in Southern California. I am sure you will enjoy her time among us and hope you will give her a warm Neighborhood Church welcome. You will be in good hands while I am away. Plan to greet her on June 17th and then hear her preach the following four Sundays. Her bio follows below. Grateful for all the connections to come! The Rev. Dr. Davida Foy Crabtree is a United Church of Christ minister who has served in a variety of settings across the Church. Her most recent position was as Interim Vice President for Advancement at Andover Newton Theological School. Prior positions include serving as Interim and Acting Conference Minister in Florida and Missouri Mid-South Conferences, and as Conference Minister for Connecticut (14 years) and for Southern California (5 years). In between, she has served as Senior Consultant to the Collegium of Officers of the UCC nationally for three years, and as consultant to local churches. Before her call to Southern California in 1991, she served as a local church pastor in CT for 11 years. Davida has a keen interest in the application of the faith to daily life. As a result she earned her Doctor of Ministry from Hartford Seminary with a focus on connecting Sunday and Monday in laity’s lives. That interest also has given her a lifelong passion for both contemporary social movements within Christianity and for the history of our life as the United Church of Christ and especially its Congregational heritage in which she grew up. Davida has recently moved into a retirement community in Connecticut which is known for its dedication to living green, and that parallels her commitment since childhood to care for the earth, a notion introduced to her by her science teacher mother. She is stepmother to two Vermonters and grandmother to five. She is looking forward to spending the early summer with the people of Neighborhood Church, but only wishes she could visit during the Christmas season, for which the church is renowned! In 2017 alone, over 900 walks attracted 107,000 walkers who together with donations from their community raised over $9,000,000! Funds raised through CROP Walks funds are distributed by Church World Service around the world-- they provide food and water, seeds, tools and other crucial resources. 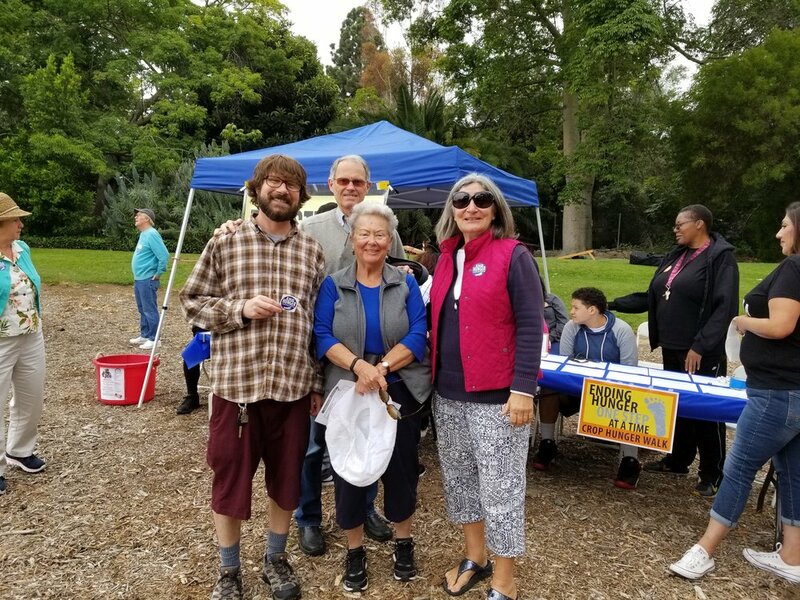 This year, Team Neighborhood Church participated in the Peninsula Harbor Crop Walk on Sunday, May 20 at the South Bay Botanic Garden. Together, our congregation surpassed our original $750 goal to raise nearly $2000! Sally and Phil Rogers generously agreed to match our $750 goal if we were able to reach it, and our members certainly rose to the challenge! We were one of the top teams in the South Bay and the top fundraising Church because of your generous contributions-- thank you! 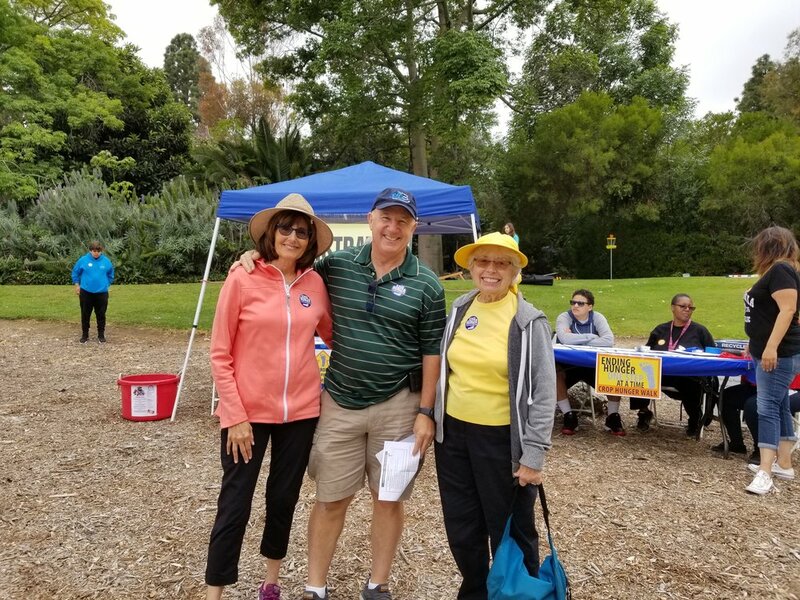 The Peninsula Harbor CROP Walk had over 20 new walkers and more than 200 walkers total. Mail in donations are still being counted, and several envelopes were turned in in person at the CROP Walk. Our team of ten walkers enjoyed the beautiful plants and flowers at the Botanic Garden. Volunteers from SHAWL House and several high school volunteers helped the day run smoothly. Thank you to everyone who contributed to the success of this year's CROP Walk-- whether through financial donations, sharing information with family and friends, or attending the walk in person. Together, we can help end hunger one step at a time. A special thanks to Christian Action Ministry for organizing this great community service event for our church, especially John Readyhoff who led up fundraising efforts and walker recruiting! Karen Tucker had an idea. She wanted to connect new members of our Church community with those who could no longer make it to Church events, either due to illness or lack of transportation. These people had served the Church for years, and she wanted them to remain a part of our Family whether they could make it to Church or not. Lauren Hardin, our Marketing, Communications and Office Manager sat down with Karen to talk about our Good Neighbor Network and it's new component, the Prayer Network. LH: Karen, since I’ve been at the Church I’ve seen you lead Christian Action Ministry, run the Tea Room at the Yule Parlor Tea and now you’ve created a new Ministry, the Good Neighbor Network. Is there anything at the Neighborhood Church you haven’t done? KT: I have served on quite a few boards and committees. It’s been a wonderful way to get to know other members of our church and I’ve made friendships that have truly lasted over time. LH: What led you to create the Good Neighbor Network? KT: Over the years I’ve seen members of our church family who can no longer get to services or participate in activities. It’s sad to see once vibrant individuals become isolated or separated from our church due to health issues, aging, or lack of transportation for example. I wanted to start a program that would reach out to them and reconnect! LH: How did you come up with the name “Good Neighbor Network?” Were there any other contenders? KT: Our church name was truly the inspiration and I think everyone understands what a network of individuals can accomplish. LH: Creating a brand new Ministry couldn’t have been easy. What were some challenges you faced throughout the process? KT: It took time to research this type of program and how to initiate it. David Young had great ideas and Mary Ann Friedrich, co-chair of GNN, had participated in a similar program at another church. They were both instrumental in helping me write the Training Guide and hold orientation sessions for our volunteers. LH: Now that the GNN is up and running (we have 17 volunteers visiting 20 homebound members of our church family! ), what have been some of the most rewarding moments you’ve experienced? KT: Listening and learning so much from the beautiful men and women who have served our church in the past. They have amazing stories to tell – where they’ve traveled, who their families are and how they’ve progressed on their journeys. Sitting with Harry Peck and seeing all his WWII albums and uniforms. Hearing Betty Larsen tell about her travels on a sail boat. It’s been incredible! LH: Tell me a little bit about how the Prayer Network came to be incorporated into the GNN. KT: It seemed like a natural progression. Engaging our faithful church family in prayer for one another. It follows the model of a good network – a variety of individuals, good communication and a connection to one another. LH: And what exactly is the Prayer Network? KT: When someone is suffering, anxious, worried, going through a difficult time in their lives or thankful, joyful and they need to seek comfort, make a request, ask for guidance, heal and restore, express sorrow, celebrate joy or give thanks – they look to God through prayer. They can submit a prayer request with as much or as little information as they wish, and it will be passed along to all the volunteers in our Prayer Network. Everyone will pray that the request will be answered. LH: In such a busy world with so much going on, what is the value of prayer? KT: I believe it is a vital part of our faith. God promises us in the Bible that he hears every word that we pray to him. Like a good parent, he is waiting, ready, and willing to listen to our worries, concerns, and needs. Whether we are seeking forgiveness, strength, or healing, prayer provides the channel to communicate with God. I believe praying daily as a group creates a spiritual bond between us that strengthens our convictions and love for one another. I love the quote from Max Lucado, “Our prayers may be awkward. Our attempts may be feeble. But since the power of prayer is in the one who hears it and not in the one who says it, our prayers do make a difference." LH: If someone has a prayer request, what’s the best way to submit it to the Prayer Network? KT: They can call, write or text the church office, one of the ministers or submit a prayer request online. If possible, it would be great to hear from the requestor if there is some resolution to their request. In September 2017, the Building and Grounds Committee of the Board of Trustees launched the Angel Projects Program, a collection of projects to repair, replace or upgrade various areas on our Church grounds. One of the earliest projects to be adopted was the garden near the front of the Church. Over the past several years, poor soil quality and lack of appropriate irrigation in that plot had turned this 650 square foot garden into a barren patch of dirt. David Yang, longtime church member, generously agreed to sponsor the funding of this project in loving memory of his wife, Shirley, who passed away in 2015. Between the two of them, they have served as part of Women's Fellowship, Christian Action Ministry, and the Board of Trustees throughout their years here. The first stage of the project began in Fall 2017 with the tilling, grading and sloping of the garden-- dirt needed to be sloped towards the driveway to allow excess water to runoff. A protective barrier also needed to be installed against the Church walls to prevent water damage to the building. An outside contractor performed this work with the help of our Facilities Manager, Doug Falzetti. Once that work was complete, the plot was one step closer to becoming a garden. Around this time, Christopher Miller, a Boy Scout and member of the Church, ,was in search of a project to earn a design and construction badge toward becoming an Eagle Scout. Christopher and his family have been attending the Neighborhood Church since 2008 and he was baptized and confirmed here. He is active in our Youth Group and also serves as the co-president of the South Bay YMCA Pathfinders Parent Youth Group. Before one of his Youth Group Meetings, Christopher walked around the Church grounds, looking for areas in need of improvement or something that could potentially become an Eagle Scout Project. He noticed the empty dirt plot and realized that, as fate would have it, his project had found him. Christopher Miller and his friend constructing the base of the pedestal for the statue. After coordinating with Doug and our Angels Projects Committee, Christopher agreed to take on responsibility for designing and constructing a significant portion of the garden. He, with other Scouts, would install a stonework pathway and construct a pedestal that would be the central feature of the garden. His father, Loy Miller, donated the building materials for these items. So, the dirt had been tilled, the land had been sloped, the irrigation had been installed and the brick had been laid... but what about the plants? Laurie Jester, longtime Church Member and landscaper extraordinaire, agreed to create a layout for the garden using a mix of water-wise plants and climbing vines to grow up the trellis that would fit in with the Church's current landscaping while creating a unique visual experience. Laurie Jester's initial map of the garden. Laurie made sure to include drought tolerant, water wise shrubs in the layout as well as incorporating Palos Verdes Stone for the walkway. The majority of these plants were donated and installed by GS Brothers, with additional landscaping provided for by David Yang's Angel Project Sponsorship and Christopher Miller's Eagle Project. Doug Falzetti and Laurie Jester helping out with the planting of plants and flowers in the garden. While Laurie set to work designing the garden, Doug performed some final work on the irrigation system. One March Friday, he was out in the garden working on the sprinkler system when a valve burst and sent water spilling out into the driveway. We placed an emergency call to our landscapers, GS Brothers, who stopped by immediately to assess the problem. They noticed the work Doug was doing on the garden and asked him what the plans were for the area. When Doug told them, they offered to donate the plants and labor to finish the garden! A week later, on March 16, GS Brothers returned with a truck full of plants and flowers. Together with some plants donated by Chrstopher and those purchased with David Yang's Angel Project donation, the garden was planted. That weekend, Christopher and the Scouts returned to finish up the planting and install the lattice and trellis for the climbing jasmine. Through a number of small coincidences and the hard work of many, the Shirley Yang Memorial Garden was fully planted and ready for Easter Sunday. A special thank you to everyone who worked so hard on this project! If you would like to learn more about Angel Projects, are interested in sponsoring one, or have one in mind, please contact the Office.